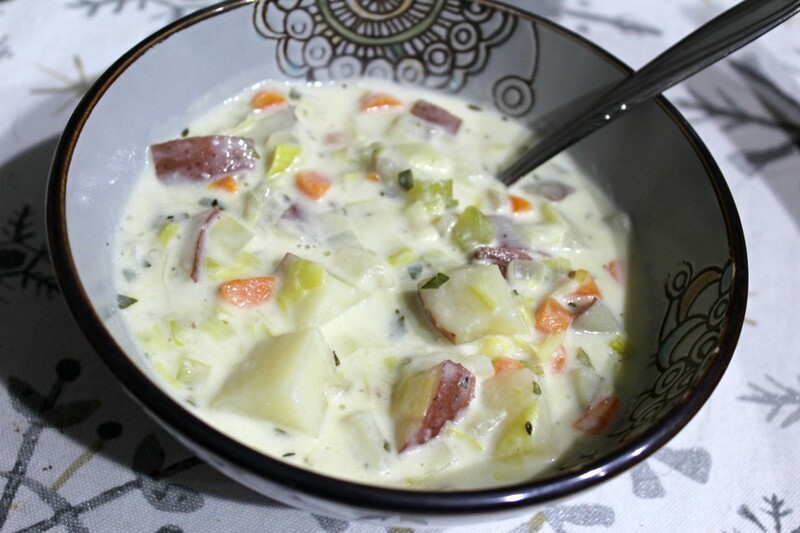 Next up on our National Soup Month celebration, Creamy Potato Soup. Confession: I love creamy soups. There’s something so comforting about them that warms the soul. You could say that’s the case for all soup, which it is, but extra for indulgent creamy soups. I haven’t yet figured out out to get the same effect without using dairy. So for today, even though I’m significantly limiting dairy in my diet these days, we’ll indulge ourselves a smidge. What’s life without a little indulgence once in a while? This recipe is as easy as it is tasty. It starts with a lot of vegetables. The classic combo of onion, carrots, and celery saute in some butter with leeks. Potatoes go into the pot next with a little parsley and thyme. The potatoes can be cut to your preference. I wanted a chunkier texture to the soup so I cubed them a little larger. For a more delicate soup, cut them into smaller cubes. This will also cut down on your cooking time, possibly even halving it. I left the skin on the red potatoes but you’re free to remove them if you prefer as well. Once the potatoes and herbs are added, pour in the chicken broth and let everything get nice and cozy for a bit. 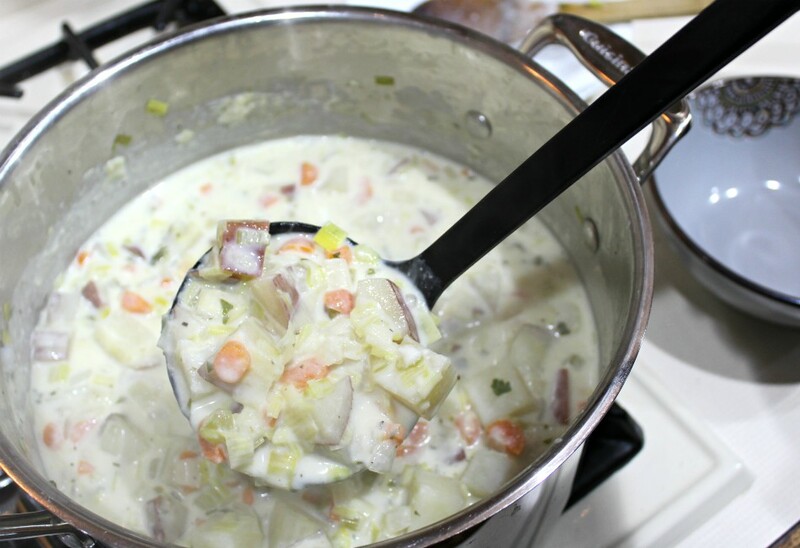 Once the potatoes are fork tender, you’re ready for the next step which is pouring the thickened cream sauce into the soup. This is important. You do not...ever...want to pour cold dairy into a pot of boiling soup. I made this mistake once and it caused everything to separate. It wasn't pleasant to look at, the flavor was off, and we all felt a little sick afterwards. Whether or not that was directly related to the soup is a mystery we’ll never figure out the answer to. While the soup is simmering for the potatoes to cook, get a saucepan on the stove over a medium heat and mix together some flour and half & half or whole milk. Whisk constantly for about 12 minutes until the mixture thickens. It might seem like it’s never going to thicken but you’ll notice as the minutes pass the cream gets a little shinier and moves a little slower. Just have patience and you’ll be glad you did later. Once the potatoes are tender and the cream has thickened, mix everything together for a seamless partnership between the soup and the cream. 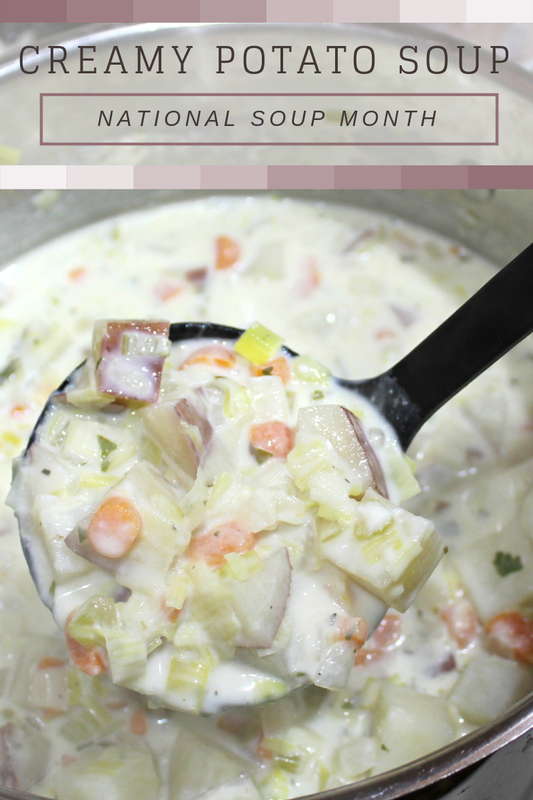 The end result should be a thick, creamy potato soup with lots of delightful veggie chunks. It is not but it can be if you use vegetable stock instead of chicken stock. Do you have to use red potatoes? No. You can use any potato you prefer, even sweet potatoes or purple potatoes. It’s completely up to you but remember that the cooking time might vary. For example, yellow potatoes tend to need less cooking time but sweet potatoes need more. 1 - Melt the butter over medium-high heat in a large pot. Add the onion, carrots, celery, and leeks. Cook 8-10 minutes until the vegetables begin to soften. Add in the potatoes, parsley and thyme. Stir to combine. 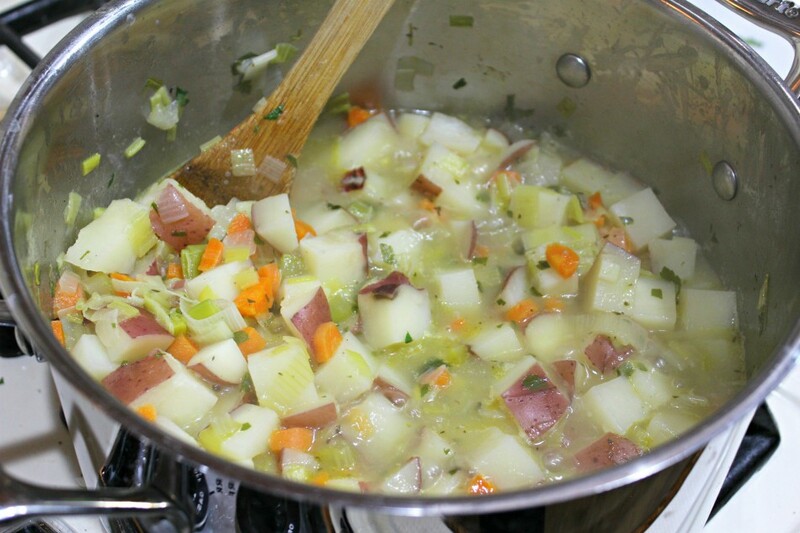 Add the chicken stock, bring to a summer and cook 30 minutes until the potatoes are tender. 2 - Meanwhile, in a medium saucepan, sprinkle the flour and heat over medium-high heat for a few seconds. Slowly, whisk in the whole milk or half & half, making sure there are no lumps. Continue to whisk for about 12 minutes until thickened. 3 - Pour the cream mixture into the soup. Stir constantly for about two minutes until incorporated. Serve.